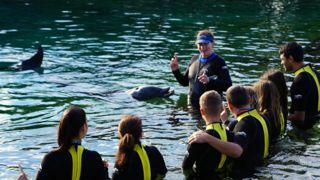 We started with Discovery Cove, a crafted land where you can swim with Dolphins, snorkel with a variety of fish and sting rays, see exotic birds and hang out on the beach. I highly recommend it for an entire day of fun. You might even start to forget that everything in the park – rocks, coral reefs, even some of the trees/logs are all fabricated. It’s a bit expensive, but it includes an entire day with all the snacks, drinks and sunscreen you can consume, plus 14 day pass to SeaWorld and their Aquatica water park. Ok, before you start to become angered at my throwing (a lot) of money at the SeaWorld organization, let’s discuss. I am not a fan of animals in captivity. I detest zoos. Yet, there I go. I believe there are two views on this issue that are very simple concepts, with a lot of people’s opinions falling in between. The good of the group vs. the value of the individual. Most Americans would never put their own children in harm’s way, yet many of our young march off to fight wars (I’m not a fan of this either). So we put our children in front of animals they might never see in the hope that they appreciate and understand the world a little bit more. Where do you draw the line? I am eternally grateful for protesters, documentary filmmakers, bloggers and those journalists who are still allowed to report the facts of investigative stories, and conspiracy theorists, because they all keep the bad guys there toes. I hope that the animals we saw were treated very well, if not only because a documentary film maker blew the whistle. I will say that my daughter now loves dolphins more than almost anything because of her ability to have close proximity to two of them. She will be a dolphin advocate. I don’t think she will ever have that experience in the wild. I explained the recent controversies regarding dolphins and killer whales to her. I encouraged her to stay informed and aware. 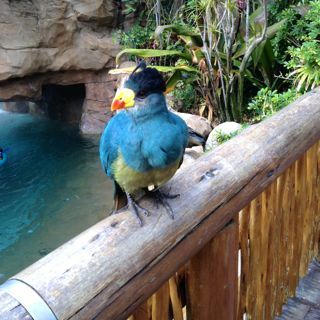 If we had never gone, she would never appreciate these beautiful animal… so I don’t have any good answers to the debate. 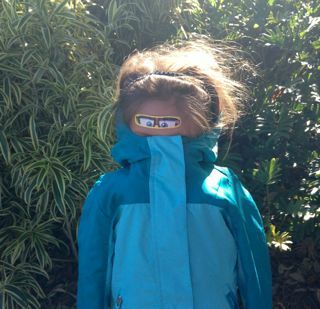 My daughter walked around SeaWorld like this for 10 minutes, finding it hilarious, but confusing and disturbing the Latin American patrons. Now, let’s talk about SeaWorld and the cruel joke they play on foreigners. We really only went to SeaWorld because of the free pass. It was OK. We saw an animal show which was cute and did a few rides (Sophia is not a ride fan so much). Then, we went to see the Killer Whale show. In the auditorium, there is a section call the Soak Zone. I came prepared for wetness with a rain jacket for Sophia and a non-soakable jacket for myself. We got there a little early, and slowly, the seats around and in front of us became filled with Latin Americans. Now, there are signs in each of the 20 or so rows that make up the Soak Zone on the back of the seating, clearly marked “Soak Zone”. However, I began to wonder how clearly this message might translate into Spanish or Portuguese, if one had the ability to try. I considered explaining it to the people sitting on either side of us, but thought perhaps they might be insulted that I didn’t believe their English was adequate enough to visit SeaWorld. So against my better judgement, I kept silent. After the first flip of the tail, there was a shocked silence over the drenched crowd that slowly evolved into nervous and confused laughter, their electronic equipment and leather jackets dripping with tank water. Then, when they realized that the whale was making another round, there was an explosion of screams and a mad dash for the exit, including the women and children sitting on either side of us. After the third round of splashing, the only people left in our section were a group of Americans in the front row, all wearing rain ponchos, and an American couple behind us, using us a shield. 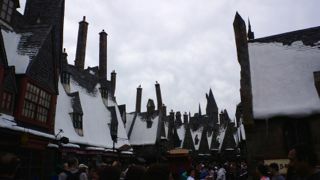 We spend the next three days at Universal Studios, mostly riding the Hogwarts Express between Diagon Alley and Hogsmead. It is really fun if you are a Harry Potter fan. The crowds were pretty calm. Sure, there was some jetinho line jumping. I do not frequent amusement parks, but I can imagine that there would be a similar level of annoying behavior if the place was filled with Americans. I didn’t even get irritated with anyone until the end of the third day. 1) Get to the parks early, it seems the majority doesn’t show up until late morning. 2) Instead of renting a car, use Uber. I would not want to be trying to navigate Orlando in a rental car. Plus, the cost of using Uber is much less than any other options, considering parking fees and/or cabs run by the local monopoly. There were Uber cars within close proximity each time we needed one and, with the exception of our first driver, who I reported, every person/car who picked us up was fantastic. 3) During the slow season, it is not worth it to buy the express pass because the wait times aren’t so ridiculous. There were a lot of rides for which we didn’t wait at all. But if you are going in the busy season, I can see why it would be worth it. 4) At Universal, the easiest way to travel between the two parks (one Harry Potter land is in one park and one is in the other) is the Hogwarts Express. But you’ll need a multi-park ticket to do so. 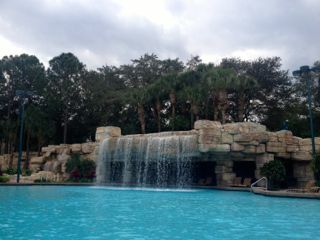 The fake waterfall and rock formation at the resort we stayed at. 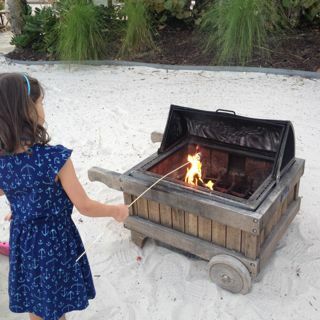 My daughter roasting marshmallows on a fake beach. The whole city of Orlando is kind of like a kid’s Las Vegas where you can have thrilling experiences fabricated just for you in a controlled environment. The trip was great and we crossed it off our list. But I don’t think we will be going back for awhile (if ever). There are plenty of “real” things in the world that we still have yet to see and do. Gallery | This entry was posted in Crazy Adventures, Culture Conflicts, Tourist Info, Travel, What the h*ll is that? and tagged American, American culture, beach, Brazilian people, Discovery Cove, Orlando, SeaWorld, Universal Studios. Bookmark the permalink. My husband (Brazilian) and I spent some time in Orlando for a vacation a few years ago. We were blown away by the number of Brazilians at the various theme parks, but that was nothing compared to the outlet mall in Orlando. I’d say 95% of the shoppers were Brazilian. One of the shoe stores we went to said they lay out the store specifically for their Brazilian customers–putting the Nike shoes and socks towards the front of the store. One woman bought bag after bag of Nike socks. My husband said she was talking to her husband about how she’d be able to make a small fortune selling them in Brazil. Yes! I forgot that we went to the outlet mall too! Yes – absolutely all Brazilians. I bet the woman makes a fortune. One of our Uber drivers told me that he had someone in his car who told him she had a friend at customs in Brazil that always made sure she got in unquestioned. But they are being taken as well. Prices at the outlet malls are no where near as good as when you get one of these big department store sales going on… it’s ridiculous. Thanks for your comment!